The grounds where the unmarked mass grave containing the remains of nearly 800 infants who died at the Bon Secours mother-and-baby home in Tuam Co Galway from 1925-1961 rests. 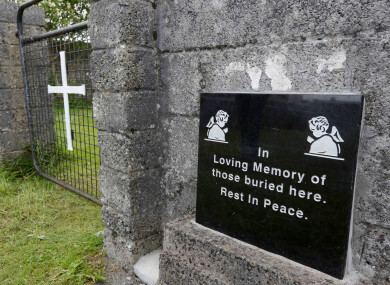 THE REMAINS OF hundreds of people buried in a mass grave in Tuam should be able to be identified due to advances in DNA testing, a team of scientists have said. The scientists contradict a government commissioned report by an expert technical group looking into the discovery of juvenile remains at the site for the former Mother and Baby Home in Tuam, Co Galway. In its report in December, the expert group concluded that identification of the remains would be difficult for a number of reasons, primarily that they would have “comingled”. A team of four from University College Dublin and Trinity College have made a submission to Galway County Council contradicting this assessment. The submission was highlighted in the Irish Times this morning. One of the scientists – Dr Stephen Donoghue of UCD – told RTÉ’s Morning Ireland today that advances in genomic technology “should allow for the identification of the remains at Tuam”. “There were a number of problems identified by the Expert Technical Group report… including the quality of the DNA and the comingling of skeletal remains and the cost associated with carrying out the DNA analysis,” Donoghue said. We felt that the report was viewed through the prism of a technology that is around 20 years old, called short tandem repeat DNA profiling. He said that a more advanced technology now allowed for better identification of “poor quality DNA”. “And these essentially allow for whole genome analysis of poor quality DNA and so really we’re saying that the remains should be identifiable at Tuam,” he said. He said that the expert technical group report was “overly pessimistic and quite circumspect”. Donoghue also stated that these more advanced methods of identification had already been employed by the Department of the Taoiseach to identify the remains of 1916 revolutionary Thomas Kent in 2015. He said that extracting DNA from the skulls of the remains would help to avoid the comingling issue. Last year, the commission of investigation into Mother and Baby Homes found “significant human remains” in a structure which appeared to be “related to the treatment/containment of sewerage and/or wastewater”. Between 1925 and 1960, 796 children died at the Tuam mother and baby home. Email “Experts say Tuam remains should be able to be identified using advanced DNA technology”. Feedback on “Experts say Tuam remains should be able to be identified using advanced DNA technology”.